Its not every day we hear Richard Branson claim he “accidentally exposed a cash loophole”. Unfortunately, we have had a barrage of complaints about this new fake news campaign illegally soliciting innocent day-traders to register with and fund trading accounts under false pretenses. It’s worth noting that these campaigns have been operating under the radar for quite a while now and not one serious website has published a scam review about this new and extremely deceptive and misleading marketing tactic. First, a word of caution, due to the highly fraudulent and authentic-looking nature of this marketing tactic, many day traders have been baited, cheated out of their money and victimized. 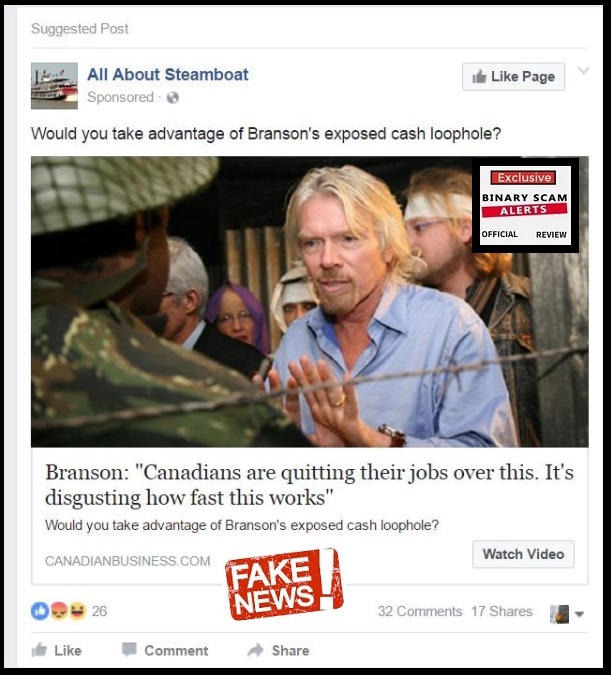 In this part 1 of an investigative series of articles, we will examine the intricate nature of this extremely effective acquisition method and try to find out who are the crooks defaming the name and reputation of Richard Branson on CNN and Facebook. Keep reading our unique review and start getting insights as to how these shady affiliate marketers operate and peddle fake apps and trading robots online. It seems there has been a massive growth in fake news websites, as well as aggressive advertising tactics on Facebook designed to lure unsuspecting customers into get-rich-quick scams. This latest development is particularly concerning for a variety of reasons. First and foremost because this form of acquisition tactic is very deceptive and believable. In reality, these marketers are piggybacking on the reputation of well-known and respected news sites and using it to peddle their fake binary options trading apps. Secondly, and maybe even more problematic is the systematic targeting and manipulation of the “work at home” niche to divert potential customers. We believe this is a particularly slimy tactic since people who look for jobs online belong to the weaker and less affluent segment of society. Below is a screenshot taken from a fake CNN news site. 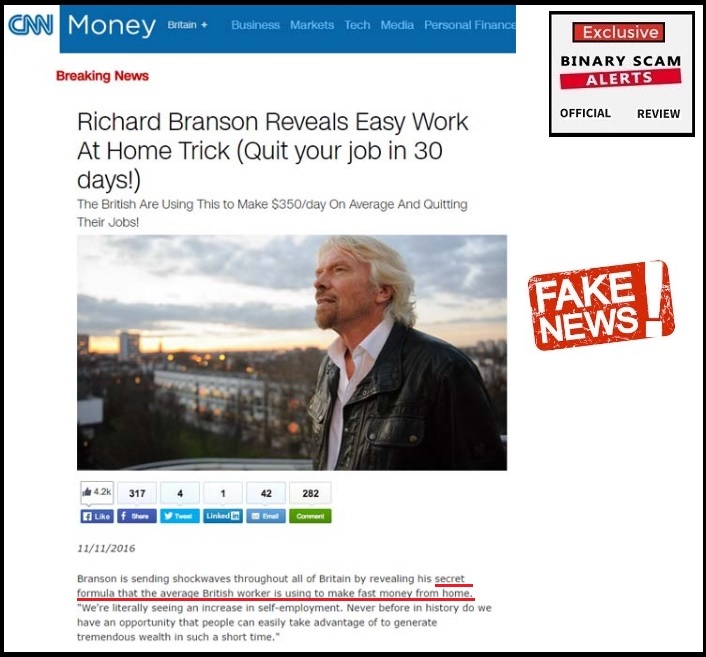 You can see how this baiting tactic is used as the article boldly claims “Richard Branson Reveals Easy Work at Home Trick (Quit Your Job in 30 Days)”. Again, we see the hype below and how he now has a “secret formula” that will generate a massive amount of cash for you. A similar format is also included as sponsored content on Facebook. However, it is in direct contradiction to Facebook’s own advertising policies. Specifically where we refer to the “misleading” aspects of false advertising. 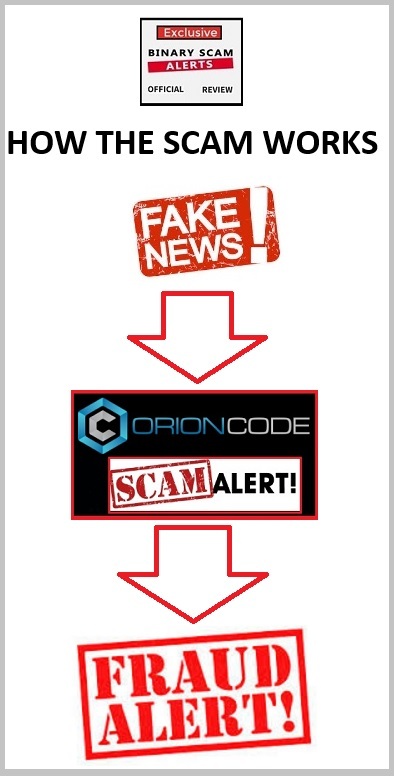 Why are crafty affiliate marketers targeting employment seekers and referring them to binary options scams like Orion Code and Quantum Code? The answer is fairly simple, but also extremely disturbing. The promoters of these scams understand that most people don’t have half a million dollars to invest with Goldman Sachs, and are willing to risk a bit of money in order to make consistent gains (even if they are moderate). The problem is that life doesn’t work this way, and taking risks is in reality the only way to become rich. But no one wants to hear that and most people are too busy living their lives and want a “short cut” to success and financial freedom. If you sign up for an offer like this you had best get ready to get your money stolen because your initial investment is not enough to cover the broker’s advertising cost so they will do anything in their power to get you to reinvest. Richard Branson is a self-made multi-billionaire and the owner of Virgin Media, Virgin Megastores, and Virgin Airlines. He is also a well-known philanthropist and socialite. In other words, his name is synonymous with the concept of rich and careless lifestyle – which is exactly what the marketers are looking for. 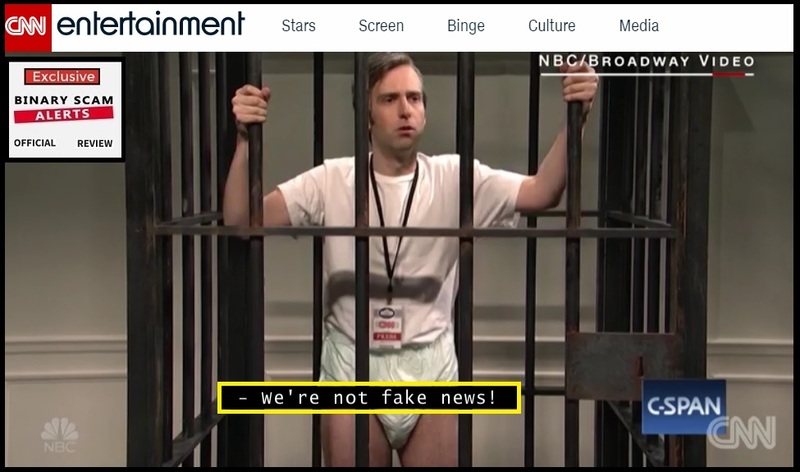 There has been much talk about fake news, especially with Donald Trump’s most recent statements about CNN and other media producing fake news reports. To put things in context, most people are not aware of, and in may cases clueless about binary options and trading online. However, there is much hype about making money online, Wall Street, and the stock market. When you dress up the actual trading process and make it look like a push button solution to all your financial problems, there will be enough people who will relate to this form of advertising and proceed to risk money in the hopes of becoming rich. Fake news is just a way to bait unsuspecting customers into this web of lies and deception, and this new trend is becoming more prevalent as it has proved to be very effective. It’s worth mentioning that this is an evolution of an existing trend where advertisers purchase space and exposure in what is professionally referred to as “above the line advertisers”. Forbes or Reuters Thompson are good examples of legit news and current events sites which accept advertising dollars paid for by get-rich-quick schemes. This has been previously discussed when we exposed the Millionaire Blueprint scam (AKA Free Money System). The image here illustrates the customer acquisition cycle and how the scam is perpetrated by the internet-savvy marketers. It’s worth mentioning that the schemes they use are very hyped up expensive productions like Orion Code. These types of scams seem to come off as very authentic and strike a cord. The sales reps operating on the broker side understand how to convince people to take out their credit card and fund trading accounts, and that is the how the scam works. Still, in the midst of all this thieving and sophisticated marketing tactics there is a rare breed of automated trading systems which have produced results consistently and have been around for years. Surprisingly, you will not find any form of hype there. There will be no inflated bank accounts, fake testimonials, actors spewing lies, or exaggerated claims of massive profits at the click of a mouse. Interestingly enough, the systems that have proven to be successful over time are simple and easy to understand, but also full of relevant information pertaining to how to navigate through the software and actually activate it and get optimal results. We are constantly reviewing new trading robots as well as signals tools and will update our recommended section accordingly. The recent attempts by affiliate marketers to deceive, mislead, bait, and victimize potential customers into registering with and funding trading accounts with offshore brokers while using fake news marketing tactics is gaining momentum. In fact, it got so bad Virin and Branson himself issued a clarification about this viral trend. A word of caution, if your intuition is telling you something is wrong and the dots don’t connect its a good thing. Chances are your skepticism will save you a pretty penny if you conduct proper research and do your due diligence. Specifically in the case of Facebook, we have launched a formal complaint with their legal desk and will make sure to update you concerning the outcome of their investigation. As always, if you are unsure about a certain software and would like to consult, feel free to contact us via our Facebook Page or YouTube channel.